The CRA Human Resources committee was established more than 15 years ago in response to rheumatologist workforce shortages across Canada and low trainee numbers. The committee has undertaken a number of important initiatives since its inception including the successful summer studentship program, the Training Rheumatologists for Tomorrow (TROT) program,1 which highlights rheumatology as a sub-specialty to students early in their medical careers, the Stand Up and Be Counted national workforce survey,2 and #MakeRheum for Rheumatology Campaign - a marketing and awareness strategy for rheumatology programs (available at rheum.ca). The committee would like to thank outgoing HR chair Dr. Alfred Cividino for his leadership on these initiatives, as well as the hard-working committee members who have served their term. Conduct an environmental scan of workforce-related research and ensure these materials are available to the CRA. Explore interprofessional collaboration opportunities related to rheumatology models of care as well as synergies with other CRA committees and related rheumatology and medical organizations (ACR, Royal College of Physicians and Surgeons of Canada). Collaborate with ongoing programs addressing workforce needs (FLIRT, TROT). Prepare materials (slides, briefs, etc.) to ensure consistent messaging about workforce shortages and an ongoing maldistribution of rheumatology resources for education and advocacy; launch a 2020 Stand Up and Be Counted Survey; continue supporting the successful summer studentship program. The committee looks forward to supporting CRA members in advocating for HR resources in their regions. 1. Cividino A, Bakowsky V, Barr S, et al. How to Attract Trainees, a Pan-Canadian Perspective: Phase 1 of the "Training the Rheumatologists of Tomorrow" Project. J Rheumatol 2016; 43(4):788-98. 2. Barber C, Jewett L, Ahluwalia V, et al. 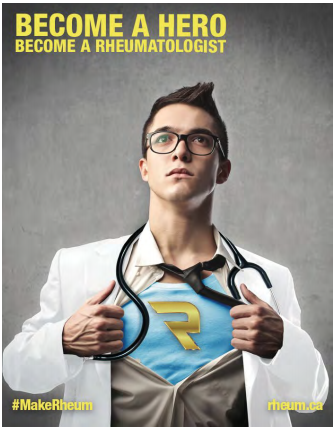 Measuring the Rheumatologist Workforce in Canada: Stand Up and Be Counted! J of Rheumatol 2016; 43(6):1204-5.